In the heart of the Livradois-Forez natural park in Auvergne, come and stay in Coqcooning bed and breakfast : a mixture of good food, rest and nature. This poultry farm offers relaxation and wellbeing. In a converted outbuilding, the four rooms were decorated by a Feng Shui architect and afford views of the valley. Guest meals, inspired by the garden, are prepared with farm produce. A cheerful, friendly welcome..
- massages sur place. - différentes formules sont proposées le week-end comprenant les repas (CoqMonsieur, CoqMadame, CoqEnPâte, se renseigner). 1 room with shower and WC and 3 rooms with balneo chromotherapy bath and WC. 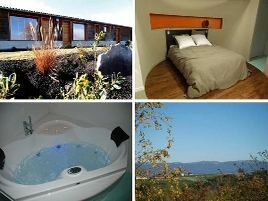 From Monday to Thursday, and depending on the room, from 80 to 95 euros (1 pers. ), 95 to 120 euros (2 pers.). For the weekend, see our deals. sortie de Domaize, route de Cunlhat. Route sur la droite, suivre les indications. The closest station is Thiers, located at 25 km. The closest airport is Aulnat, to 43 km.